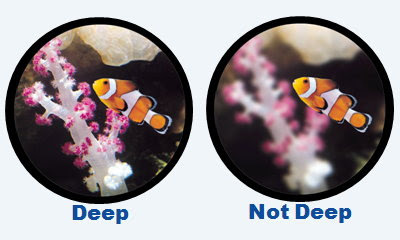 Depth of Field - The range of distance that is in focus without moving your head. This deteremines how much you lean in or lean back while wearing your loupe, and still maintaining focus of the entire viewing field. A large depth of field is ergonomically beneficial since you would not need to move your head or back much to work effectively. Field of View/Field Width - This is the size of the operating site seen through the loupes. 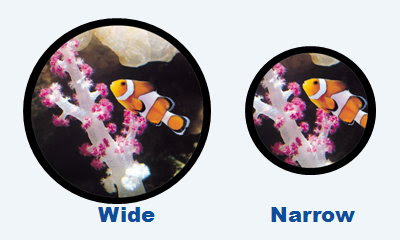 Having a wide field of view makes it easier and quicker to adjust from the loupes to the naked eye. It also causes less eye fatigue. * the higher the magnifying power, the smaller the field. * the longer the working distance, the larger the field of view. 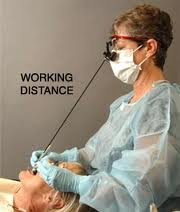 Working Distance/Angle- The distance between your eyes and the patients oral cavity when sitting in a normal ergonomic position. This varies by each person's height, body type, or how you sit while with patients. Because the correct working angle allows you to sit in the correct ergonomic position it prevents neck and back pain. Flip-Up versus TTL type - Each has their specific Pros and Cons and depends on your preference. Refer to Dental Loupes part I for pros and cons. Resolution - The capability to view small structures and the clarity at which they are seen. This is established by the optical design and the use of precision lenses. Magnification - This is the size of the object seen through the loupes (not clarity). There is no accepted standard for how magnifying power is defined for surgical loupes. 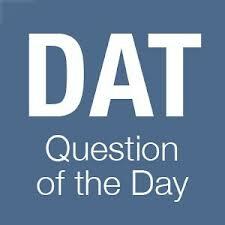 Different definitions give results that differ by as much as 15-percent. Because of this, the quoted magnifying power is really only a rough guide to the actual magnification of a loupe. Comfort, Weight and Design - these all go hand in hand as the comfort of the loupe depends on the weight and the ergonomic design of the frame. 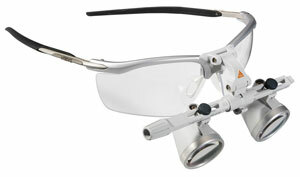 I have provided the websites for the more popular loupes manufacturers out there. Some of their specifications are slightly different and they all are unique in their own right. Visit the sites for your own comparison, in addition to mine. Surgitel is pretty good in my opinion, it has a wide variety of loupes with magnifications from 2.5x to 8x. The Oakley frames are a popular option but I personally like the Ultralight TTL. It has 2.5x and 3x capability, expanded field sizes and long depth of fields. They are also uniquely stylish! 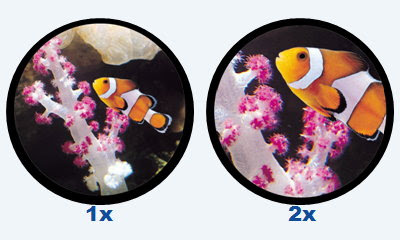 Orascoptic is one of the more popular choices with magnifications of 2.0x to 5.9x. I personally really like orascoptic HiRes2 because they are light weight, has high resolution with a wide and deep field, plus they are stylish and comfortable. Sheer Vision loupes are another set of loupes that I think are really good. They come in a variety of types from flip ups to TTLs with a few frame options. They have magnifications from 2.5x to 3.5x. They sport an expanded field of view, exceptional depth of field, sharp ede to edge clarity and are multi coated for anti glare, anti scratch and anti fog resistance. 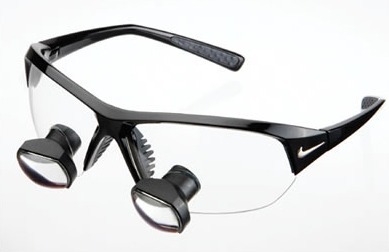 Design for Vision loupes has magnifications from 2.5x to 4.5x and comes with designer and sport frames like Nike as well as other types. 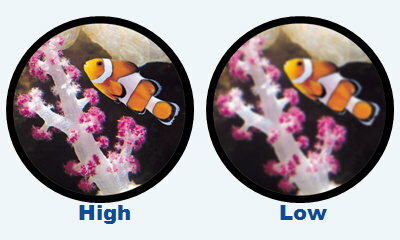 Heine loupes has magnifications of 2x to 2.5x. According to Dentistry Today, Heine loupes are unique in their ability to relieve stress of the practitioner. It features a 3 point articulation system that allows a higher angle of declination than TTLs. The i-view S frame allows for complete adjustment of the angle of declination from a 0 to 45 degree angle. Loupes are an expensive but worthwhile investment. It is important that you do your research before making a decision and a commitment. NOTE: If you contact a representative from any loupe brand, they are usually happy to have you borrow a pair for a couple weeks to try them out (for FREE). Try as many as you want to see which one's best for you. I am Loupe Direct. I liked your blog. I have a good suggesting about Headlight . We're learning all about loupes so we can buy them for GRD in the spring here at Penn. So many things to consider including price- these loupes are expensive! Great informative post. They are very expensive! Hope this helps you some how. Hi, your are right these loupes are very expensive. I have a pair of Loupes which were very reasonable and are great for students from an online company called LA Lens www.la-lens.com . They produce fully custom loupes that take prescriptions starting at $595.00, if you struggling to part with your cash and don't want to sacrifice on quality I highly recommend them! generic loupe (no brand), bought from ebay.com, around 220USD. My colleagues hesitated its quality, but it works very well, i asked my colleagues to try it and all of them were surprised with the good visual and magnification. I loved it since the first time i use it. 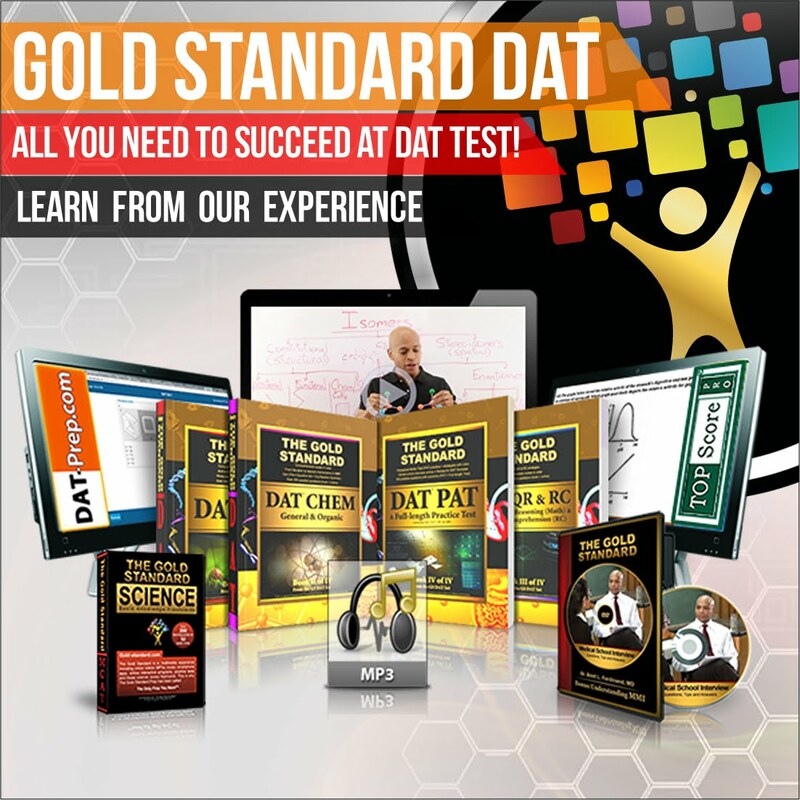 Only take 1 day to be adapted. 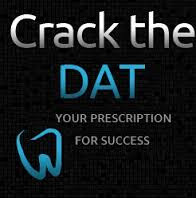 I use routinely to fill cavities, root canal treatment, crown preps, and even scaling. It gives better hand and finger control, better ergonomics (straight back), proper work distance (avoid saliva n debris splatters), better visualisation and evaluation of caries, cracks, orifices, filling contour smoothness and crown prep chamfer smoothness.